ubiGENIE is the new Ubidata initiative which is aimed directly at alleviating the complexities of the freight forwarding process. 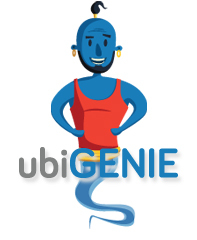 ubiGENIE is a highly effective logistics system to support your mobile logisitcs needs. You can track and trace your goods with ubiGENIE but it also extends the benefits to showing instant proof of delivery and other live status updates and alerts on problems along the way. Documents can be scanned by the driver and instantly sent to the web application, ubi.TT. With ubiGENIE you also automatically enjoy the benefits of paperless eCMR of which Ubidata is one of only 6 approved providers in Belgium. We've made it easy for you: your transport companies need pay nothing so there's no burden on them to use this system which in turn helps you save time. It's simple for the transporters to use as all they have to do is download the free app to their smartphone and they are ready to go. The ubiGENIE also makes the transporters' wishes come true too as it includes a mapping and directions facility which guides them magically to their destination and helps the dispatcher locate them anytime. The transporter can also send photographic updates of any problems with the goods straight to ubi.TT, your desktop application. All you need is a browser, ubiGENIE does the rest. Via a convenient messenger you can communicate directly with the driver without having to waste time searching for cell phone numbers, etc. Based on pre-set parameters, you will be informed about the things that matter to you without having to be permanently fishing for info. Alerts, text messages, e-mail keep you informed of what really requires your attention - helping you stay proactive to your customer's level of service. Furthermore the solution is perfect when you combine it with our e-CMR. After signature on glass, you have the perfect POD (with the possibility of including photo) and you have also met all legal obligations! Without paper and all info directly in your own system. Our Vehicle Check module helps avoid liability problems with sub-contractors hauling your semi-trailers or containers. Vehicle Check allows the driver to report on any issues with the trailers and containers and immediately share image proof. All this information helps you keep all parties in the logistics supply chain up to date. All of this process is managed via our easy-to-use track and trace software, ubi.TT. Given that it is also completely compatible with your Transport Management System we think there's no reason for you not to use ubiGENIE. All you have to do is say Abracadabra to our business development team and they'd be glad to show you a demo.